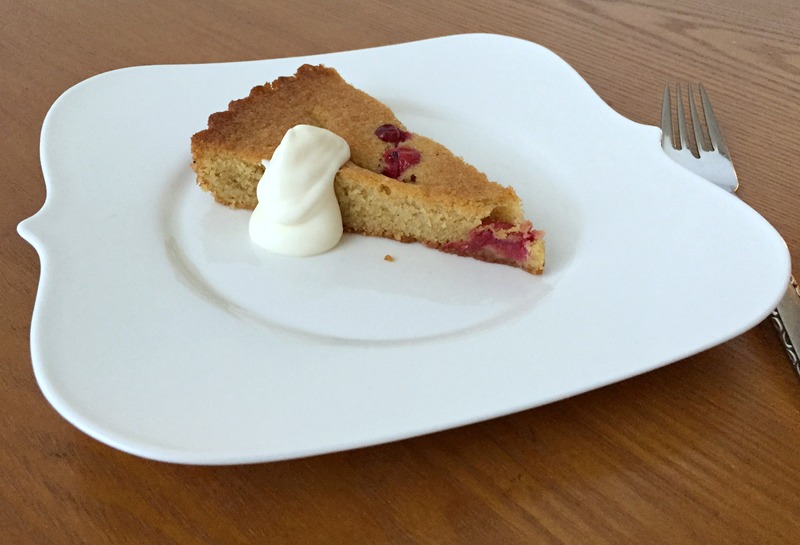 One thing I do remember is when I learned about the puffy almond cream called frangipane. It was when I first read Dorie Greenspan’s Baking: From My Home to Yours., probably in 2006 or 2007. 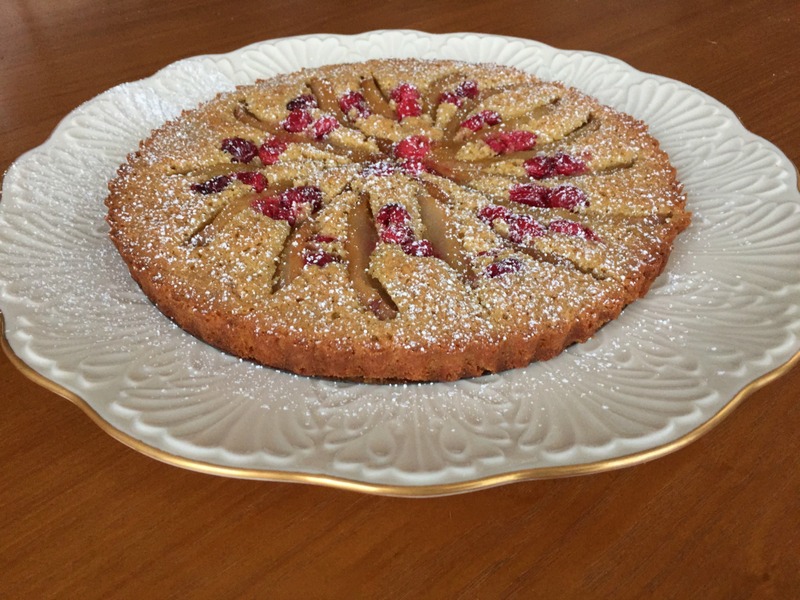 Though Brown Sugar–Apple Cheesecake, Quick Classic Berry Tart, and World Peace Cookies (all delicious) went on my “Must makes ASAP” list, Dorie’s iconic-in-my-world pear frangipane tart captivated me. Perhaps in Reading her words—”Really more a luxurious spread than a cream, it comes into its own when baked…[It] puffs and develops a light crust. Inside it remains soft and creamy and deeply flavored by its namesake ingredient.”—I felt like I had tasted it. And that was because I had. It had filled an apple tart that I had eaten at a tourist trap of a restaurant in Paris on a high school trip—I just hadn’t known it at the time. I think of frangipane as my thing now. I made Dorie’s tart for the centerpiece of our Christmas meal that year. Holidays are the times when I step back from my experiments and actually bake from the cookbooks that give me so much inspiration. 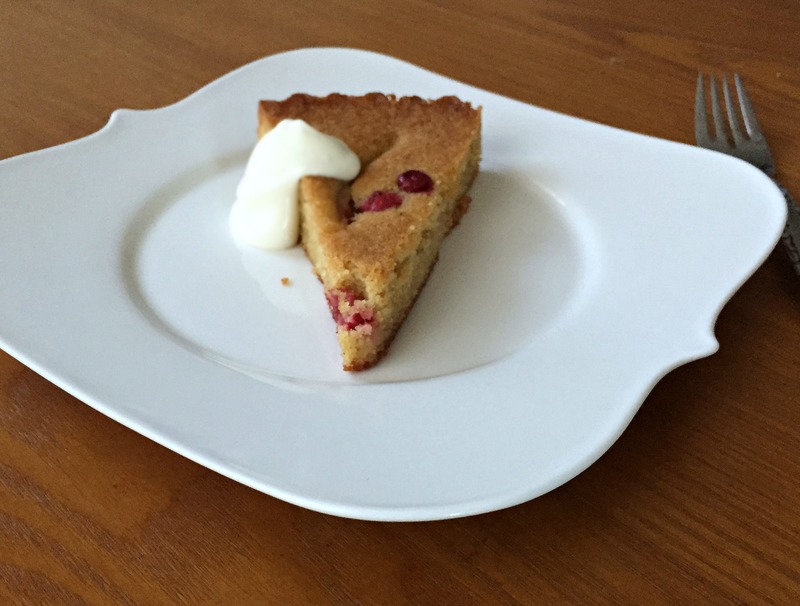 Since I served that pear tart, every couple of years, frangipane and pears have appeared at Christmas dinner. I’ve made a chocolate frangipane tart with pears and a pear and cranberry crostata with a layer of frangipane. It’s part of the reason Dorie’s Baking (along with her other books) is one of the most beloved on my shelves. This time, I wanted to use frangipane as a jumping off point for a crustless tart since I enjoyed the chocolate one so much. But as I tested, I kept making the almond base incrementally cakier until the dessert became more of a torte (less liquid ingredients, some baking powder, and a little over a tablespoon of rice flour do the trick). The thin, tender cake gets its flavor not only from the almond flour that builds out its crumb, but also from browned butter. The batter puffs, as promised, decoratively through the fruit and the smooth-topped torte turns a beautiful golden brown. 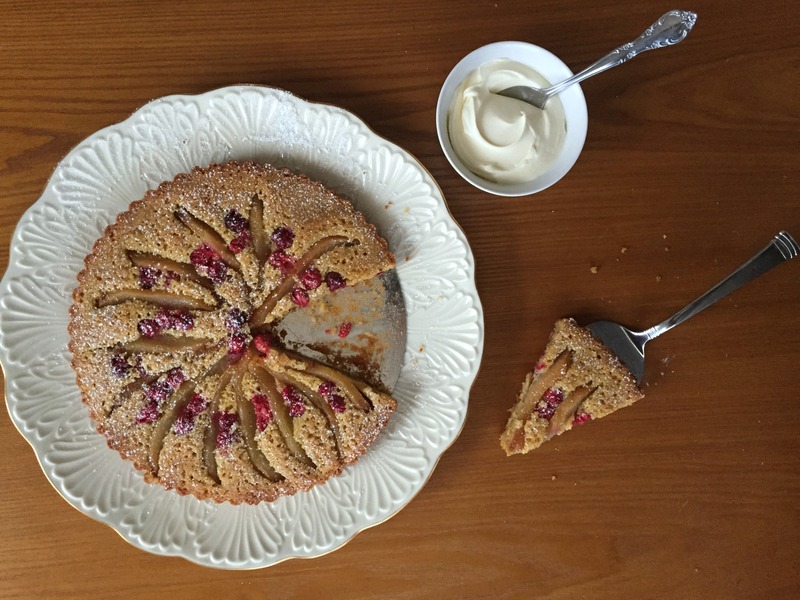 To me, the best, lightest frangipanes are made from creaming butter and sugar, and I didn’t like versions of this frangipane-inspired torte that I made with the browned butter stirred in. So this recipe calls for browning butter and chilling it in the refrigerator so that it resolidifies and can be creamed (albeit in nontraditional ways). The rich, nutty flavor of the cake is brightened by the tart cranberries that accent the floral, fragrant roasted pears. While I’d love to make something multi-layered or puff-pastried from a new cookbook this year, I’ll be making this dessert for a very rustic last-minute Christmas this year (I’ll be arriving at my folks’ house the night of Christmas Eve and leaving the morning after Christmas) because it tastes better the second day so I can make it and transport it. And while eating it, I will recall the cookbook recipes past that inspired it as well as my first taste of frangipane in Paris. I tested this recipe with Bosc, Bartlett, Comice, and Anjou pears and all worked nicely, though the shape of the bosc pears made the tart made with them slightly more attractive than those made with the others. You need a kitchen scale for this recipe. You can substitute all-purpose flour for the rice flour, just wait to mix it in until the almonds are fully incorporated. I have not tested this with a hand mixer; if you try it,make sure the eggs are fully incorporated into the batter before proceeding (it will take longer). The torte is not very sweet but it doesn’t need the sweetness of the confectioners’ sugar; it’s just there for aesthetic festive reasons. The resolidified browned butter has different properties (less water, more fat) than regular butter, so it doesn’t hold air as easily, hence the odd creaming directions. 2. For the Torte: Line medium bowl with parchment paper. Melt butter in 12-inch light-colored skillet over medium-low heat. Once melted, continue to cook, stirring frequently with rubber spatula, until milk solids have turned dark brown, liquid has turned golden, and butter smells of toasted hazelnuts, about 10 minutes (stir constantly during last 3 minutes). Pour browned butter into prepared bowl and refrigerate until completely solidified and cold, at least 8 hours or up to 1 day. 3. When ready to make torte, heat oven to 350 degrees. Grease 9-inch round tart pan and set on parchment-lined baking sheet. Cut each pear lengthwise into ½-inch pieces. Line platter with paper towels and lay out pear slices. Cover pears with another layer of paper towels so excess moisture is absorbed. Meanwhile, cut solidified browned butter into 1-inch pieces. Weigh out 100 grams of butter, discarding excess or reserving for another use. Let butter sit at room temperature until it registers 55 degrees (or until it is still cold and not yet soft or room temperature, for those without a thermometer). Whisk almond flour, rice flour, baking powder, and salt together in medium bowl. 4.Beat butter and sugar in bowl of stand mixer on medium speed until combined. Increase speed to medium-high and beat until mixture is light and fluffy, about 5 minutes (do not overbeat or mixture will become too warm and greasy). Reduce mixer speed to medium-low and, with mixer running, slowly beat in eggs in 3 additions, making sure each addition is combined before adding the next (mixture will look curdled). Increase speed to medium-high and beat until mixture no longer looks curdled, 1 to 2 minutes. Beat in bourbon until combined. Decrease speed to medium-low and mix in almond flour mixture in 3 additions until fully incorporated. Give batter final stir by hand. 5. Transfer batter to prepared tart pan and smooth top with spatula. Arrange pear slices and cranberries in the pattern of your liking in batter, inserting pear slices at an angle and pressing in but ensuring that slices don’t touch bottom of the pan (or they might stick). Bake torte until puffed, golden, and toothpick inserted in center comes out clean, 40 to 50 minutes, rotating sheet halfway through baking. Transfer sheet to wire rack and let torte cool completely, about 1 hour, before unmolding. Remove outer ring of tart pan and dust with confectioners’ sugar, if desired. Serve slices with dollop of crème fraîche. Frangipane AND brown butter?? Heaven! Hope you have a perfectly lovely holiday, Sacha.